From 1880 through 1940, the circus was the main form of entertainment in America, and the most common live form of entertainment. The circus brought the exotic and transgressive to big cities and small towns alike, exposing Americans to the strange, unusual, and death-defying: trapeze artists and tightrope walkers, equestrians and lion tamers, clowns and magicians, strong men and tattoo artists – and scores of women who challenged gender roles on multiple fronts. Sometimes these subversive acts proved as simple as displaying one’s “freakish” body in public; other times they involved highly skilled and dangerous stunts which required years of training to perfect. Bearded women, tall women, fat ladies, and other “born freaks” challenged traditional ideas of masculinity and femininity, while daredevil performers such as female equestrians, sharpshooters, animal trainers, hot rod tricksters, and human cannonballs claimed masculine realms as their own. Likewise, skeletal and short men – particularly when paired with their feminine opposites – also toyed with viewers’ perceptions of masculinity. “Manly” women were sometimes presented as the logical conclusion of feminism (i.e., women with facial hair are the next step in the evolution of the New Woman). Delivering her from the "happiest place on earth." In the ad, a dilapidated, run-down traveling circus sets up camp next to a pristine, idyllic pasture. Over a white picket fence, the eyes of two horses meet – love at first sight. On one side of divide is Daisy, the circus’s “show” horse; on the other, our hero Romeo, a [Budweiser] Clydesdale. The two horses run to one other – in cinematic slow motion – and embrace. Daisy and Romeo’s loving gazes and sweet nuzzles are rudely interrupted by the circus owner, who hauls poor Daisy off into a creaky old trailer, promptly kidnapping her off into the sunset, away from the distraught Romeo. Set to strains of “Ain’t No Mountain High Enough,” Romeo sets out in search of his love, traversing meadows, rivers, cliffs – even golf courses and city streets thick with traffic. 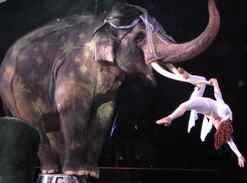 Once Romeo catches up to the circus, he bursts into the tent in which Daisy is performing. The circus owner catches Romeo’s eye and knows what’s coming; Daisy bucks her rider, and she and Romeo escape together, ripping through the canvas of the tent for extra-dramatic effect. 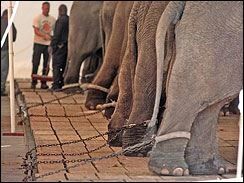 RIGHT: Animal Protection Institute photo, January 2005 in Jacksonville, Florida, shows Ringling elephants chained immediately after exiting a transport train (AP Photo/API, Bradley Stookey). – Submit your comments to the National Marine Fisheries Service to prevent the tragic deaths of sea lions. – California residents are urgently needed to attend hearing Tuesday, February 12, and to write to Supervisors to urge ordinance approval. ** Honor Your Valentine with a Gift from the Heart: Receive a free, organic, cotton T-shirt with your donation of $75 or more to our 2008 campaigns. Please join the growing international movement to protect this ecological jewel and voice your opposition to the proposed Hydroelectric Projects. Fill out the form below to urge your Representative and Senators to support the Endangered Species Recovery Act of 2007 (H.R. 1422 and S. 700), important legislation that would help private landowners protect Utah prairie dogs and other imperiled wildlife that live on their property. Tell the administration to stop trying to diminish the buffer zone rule and start enforcing it! Natural Resources Defense Council (NRDC): Tell the U.S. Navy to Stop Killing Whales! Ear-splitting military sonar is needlessly killing whales and other marine mammals throughout the world’s oceans. Yet the Navy has refused to put effective safeguards in place during testing and training. Tell Congress to do its part — and join in the effort to protect these creatures world-wide. Electronic Frontier Foundation (EFF): Stop the Spying! Tell the government to stop surveillance of Americans’ communications without a warrant. People for the American Way (PFAW): Tell Congress: End Warrantless Spying on Americans! Tell your members of Congress how you feel about the Bush administration’s warrantless spying on Americans. Union of Concerned Scientists (UCS): Urge Congress to Hold Strong on a Clean Energy Bill! Please tell your senators and representative that America’s new Energy Bill must include a 35 mile per gallon fuel economy standard AND a 15 percent renewable electricity standard.